SOCHI, Russia ― This here was overwrought. This Bolshoy Ice Dome ― from the stands to the bench, from the Russian president high above to the stadium workers who had left their posts and flooded the aisles to watch ― had fallen into a collective madhouse of edginess. Nearly 12,000 had secured precious tickets, yet here with the game on the line, with USA vs. Russia going deeper and deeper into penalty shots, harder and harder into history, back and forth and back again, some fans covered their eyes because to see was almost too much. Others simply screamed like they were about to witness a car wreck. The score was 2-2, but overtime was over, and now it was just about who could charge in alone on a goalie and score, a complex team game boiled down to one-on-one. Eventually even that went to sudden death, each miss, each make just ramping things up further, the perfect capper on an absolutely brilliant game played at the most elite of levels. On the U.S. bench, coach Dan Bylsma felt every bit of the pressure ― "I aged a couple years," he'd say later. Forward Max Pacioretty said watching was so intense that "I almost had a heart attack." These games, these opportunities are overwhelming and rare. 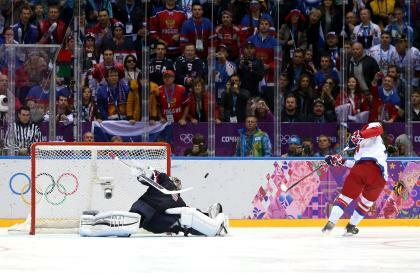 Here was a chance to beat Russia in Russia with the whole world watching. So Bylsma threw coaching convention out and kept turning to perhaps the one person in the building without seemingly a care in the world. 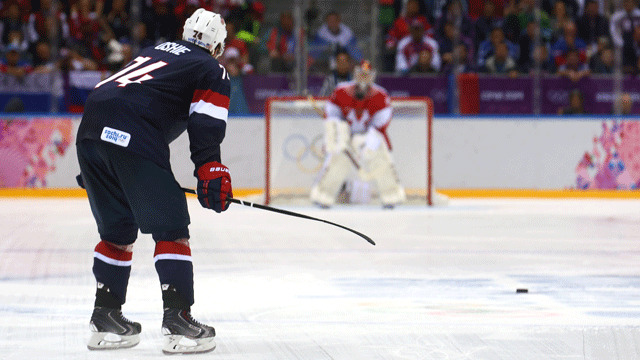 Olympic rules allow that once a shootout hits the fourth round, a coach can just keep using the same shooter. So Bylma kept calling T.J. Oshie's name and T.J. Oshie kept reacting by hopping over the boards, as a small, boyish grin crossed his face. "I was just thinking of something else I could do, keep them guessing," Oshie said. So here was this hockey game, with two nations watching from home, stomachs churning there as well, and the Americans were basically a two-man team. Oshie on offense. Goaltender Jonathan Quick on D. That was it. That was the plan. Usually an offensive player will run out of moves to fool the goaltender. Or you want to use two or three just to change things up to keep the goalie off balance. Captain Zach Parise and star winger Patrick Kane never touched the ice in the shootout. James van Riemsdyk and Joe Pavelski got a mandated one chance and then sat. The Americans were all in on one guy. "We were going to ride him out," Bylsma said. Oshie is 27; grew up near Seattle; moved to little, hockey-rich Warroad, Minn., hard by the Canadian border, for high school; played at the University of North Dakota; and is now with the St. Louis Blues. He is not one of the best players in the NHL. He's good, not great. This is his fifth season in the league, and the right winger has never scored 20 goals in a season. He's plagued by inconsistency. He's never been named an All-Star. He's on the national team, mostly, because he possesses a singular skill. He may own the finest, or at least the most, penalty shot moves in the world. He's tied for the league lead in shootout goals this season. He leaves even NHL stars in awe. It starts with this slow, swooping, looping approach to the net, with wide turns, good for allowing him to attack at any point and disguise his intent as long as possible. Then he unleashes the puck from a vast array of shots. "I've seen it a thousand times in games and in practice," Blues teammate David Backes said. "That little move he makes, it kind of makes me chuckle, I can't do that one or the second one or the third one or the fourth one or any of them. … Which one he is going to pull out is unknown until it's off his stick." Off the ice, Oshie is described by teammates as hyper, with attention deficit issues they laugh about. "Someone asked me what kind of dog he would be if he was a dog and I said that he is a Jack Russell terrier," said Backes, who rooms with Oshie here. "He needs his attention directed or he gets into a bit of mischief." Yet in a penalty shootout, everything slows down on the ice for Oshie and then, amazingly, slows perhaps again in the loneliest of moments. The pressure produces a calm, a confidence. He wants the puck on his tape. He wants to be the one staring down at a howitzer shot of Alex Ovechkin and diving to block it. He wants the biggest of moments. He wants to go alone against all the Russian gunners in the game, a parade of megastars of Evgeni Malkin, Pavel Datsyuk and Ilya Kovalchuk. "That's vintage Osh, having fun," Dave Hakstol, his coach at North Dakota, told Yahoo Sports. "Before each shot that he took he had a little grin. Maybe some others would feel the enormity and pressure of that situation. But he just loves the competition." "It just felt like he was going to score every time," Bylsma said. He scored on round one of the shootout, missed in round four, scored in five and six and then was stopped in round seven. He thought that might be it, that he'd given the Russians their chance. Quick brilliantly stuffed Kovalchuk, however, leaving Oshie last at-bats and that's when the Russian fans, who'd seen enough of this guy, took panic to a new level. "Every kid, every guy growing up wants to do the shootout," he said. "It's fun." The last one, the eighth round, started with the same east-west route before he shot it between Russian goaltender Sergei Bobrovski's legs and it ended, for a fourth time, in the net. He immediately turned to a charging bench of teammates and pointed back at Quick, trying to direct them to go hug the goalie. Only a couple listened. This was a two-man operation, but the goaltender is always there. We've seen that brilliance before. 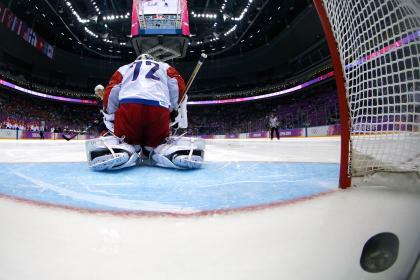 What T.J. Oshie did was something almost unfathomable: six penalty shots, five in a row with four goals to silence a deafening arena and beat these outrageous Russians on their very own ice at their very own Olympics. "It is heartbreaking," Bobrovski said. "This is what the Olympics is all about," Backes said. "Owning your moment." When it was all done, Oshie was able to admit that maybe he wasn't as collected as he appeared, that the magnitude of this moment was inescapable. Even for him. "My hands are a little tingling," he said. "My feet are tingling. It was pretty nerve racking out there." Amid the madness that he'd created, amid this wild, furious night of hockey, he finished his media session quickly, taking just three minutes to express what will be replayed and celebrated for years. There was no need to gloat or go on or pat himself on the back. Later, he was told he was a freshly minted American hero. "American heroes are wearing camo," he said. "That's not me." Instead, he just smiled again and headed off into hockey lore.